WATERLOO – Kaitlin Ouellette-Matthews has been named the first recipient of the Equitable Life of Canada Student of the Year Award, which recognizes outstanding students in the co-operative education program at Wilfrid Laurier University. Ouellette-Matthews, a third-year Bachelor of Business Administration student, was selected for her academic, on-the-job and leadership activities. She is among Laurier co-op students from the faculties of Arts, Business, Economics and Science who are employed in more than 1,600 work terms each year. Ouellette-Matthews completed her first work term as a category specialist in the Merchandising Department at Staples Canada, where her role included proofreading advertisements, allocating inventory to stores and participating in negotiations with vendors. Ouellette-Matthews says the experience helped refine her career goal by making her passionate about sales and account management. She secured a role in customer development with Unilever for her second work term this winter. 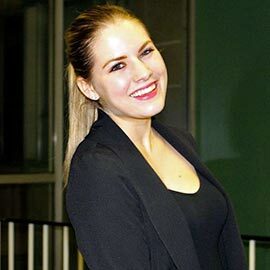 She uses the organizational and leadership skills she gained at Staples in her role as vice president of internal affairs for the Laurier Sales Association, and she shares her experience with other co-op students as a mentor on the Co-op Student Advisory Council. Her dedication to her studies has allowed her to maintain an 11.3 out of 12 GPA and to remain on the Dean’s Honour Roll each year. Laurier Co-op Co-ordinator Jocelyn Richard nominated Ouellete-Matthews for the award. “I believe that Kaitlin’s dedication to excellence, her pursuit of academic achievement, her strong commitment to promoting co-op and her campus leadership make her worthy of consideration,” she wrote in her nomination. Each year, Laurier recognizes outstanding co-op student achievement and initiatives, which are celebrated during National Co-operative Education Week, March 16-20 through the Canadian Association of Co-operative Education (CAFCE). Currently there are 79 CAFCE member institutions across Canada and the U.S. representing over 80,000 students. Laurier offers the largest co-op business degree program in Canada. For more information or to hire a co-op student, please visit wlu.ca/co-op or call 519.884.0710 x4484.